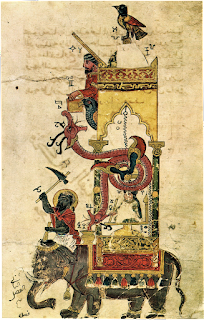 Elephant Clock, a leaf from Al-Jazari's 1205 AD manuscript "The book of knowledge of ingeniuos mechanical devices" "الجامع بين العلم والعمل النافع في صناعة الحيل" ..
timekeeping bowl floating in a tank filled with water inside the indian/african elephant, an Egyption phoenix, Arab mechanical men, a Persian carpet, Chinese dragons. All of which worked in sync to mark every half-hour of the day as it passed. Its working reproduction is displayed at 1001 inventions exhibition...at Ibn Batuta shopping mall in Dubai, UAE...at Musée d'Horlogerie du Locle and Château des Monts, in Le Locle, Switzerland.